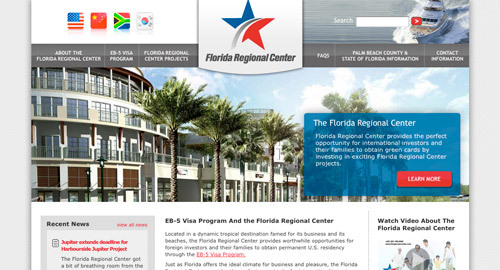 While the U. S. government-approved Florida Regional Center may seem like just another set of development projects, it actually provides investment opportunities to foreign nationals that help to fund Florida real estate development projects through the U.S. government EB-5 Visa Program. The nationally-acclaimed EB-5 Visa Program was designed to stimulate the American economy and job growth by providing foreign investors with permanent U.S. residency in exchange for their investments. The Florida Regional Center would bring the benefits of the EB-5 Visa Program to the business community of Palm Beach County. The regional center projects must be approved by the U.S. government and the main criteria is that each investor’s contribution will create ten sustainable jobs for U.S. workers in a designated geographical region. With this venture, MDG invested its talents by developing a compelling logo, engaging Web site, collateral and trade show displays for the Florida Regional Center. For the logo, our creative team used a patriotic symbol and colors to represent America. In the center, a broad gray stripe represents the “road” to citizenship. 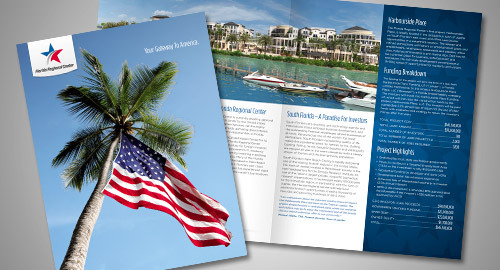 The Web site was designed to be both informative and appealing by providing facts about the EB-5 Visa Program while touting the features of Florida’s desirable climate for business and pleasure. The Web site also highlights proposed projects to further generate excitement. MDG Advertising handles all creative, marketing, advertising, collateral design and Web development for the Florida Regional Center.